For the Architect, particularly, [the Japanese print] is a quickening inspiration… owing to its essentially structural character and diverse materials and methods. 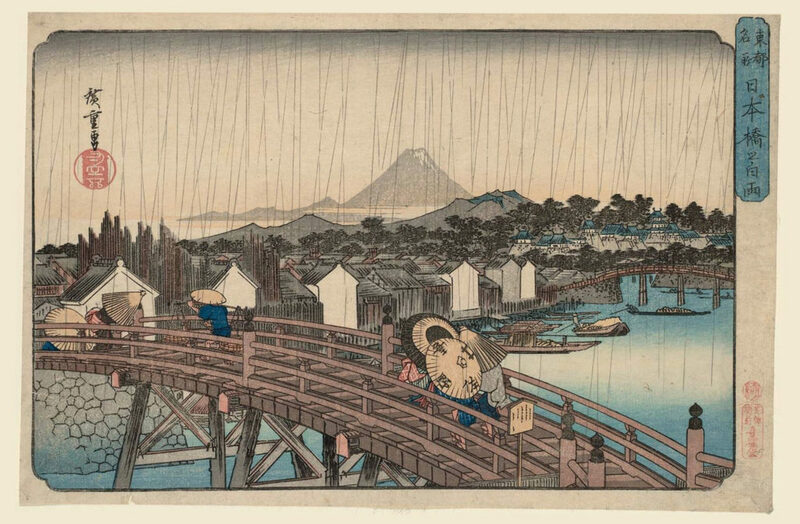 A pioneer collector and dealer of Japanese prints, Wright’s interest in the art and culture of Japan was sparked early in his career during his Chicago years. Wright’s first employer in the city, Joseph Lyman Silsbee, was an avid collector of Japanese art. Silsbee’s cousin, Ernest Fenollosa, was one of the first Western experts in East Asian art and literature, serving as Professor of Philosophy at Tokyo University, Curator of the Imperial Museum of Japan, and Curator of Oriental Art at the Museum of Fine Arts, Boston. In addition to Japanese art, Silsbee introduced Wright to the Japanesque Shingle style of architecture that informed Wright’s earliest residential designs, including his own home built in Oak Park in 1889. 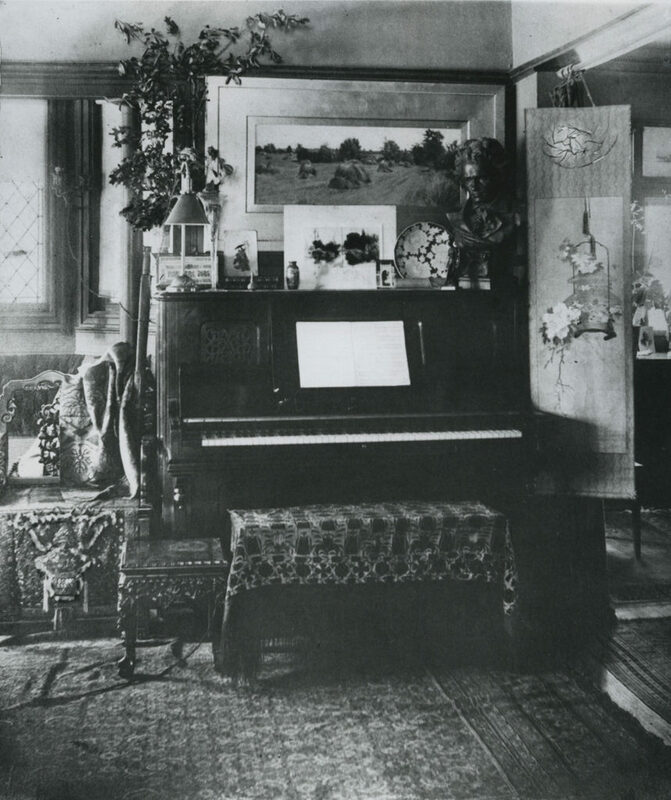 Photographs of the home, taken by Wright in the 1890s, reveal Japanese prints and objects displayed throughout the interiors. In 1908, Wright participated in a second, larger exhibition at the Art Institute, featuring prints from his own collection along with works owned by major collectors, John H. Wrenn, Clarence Buckingham, Frederick W. Gookin, and J. Clarence Webster. Wright contributed almost a quarter of the 649 works that comprised the exhibition, a significant showing for his collecting efforts to that point. Again, the architect designed the installation and layout for the exhibition. 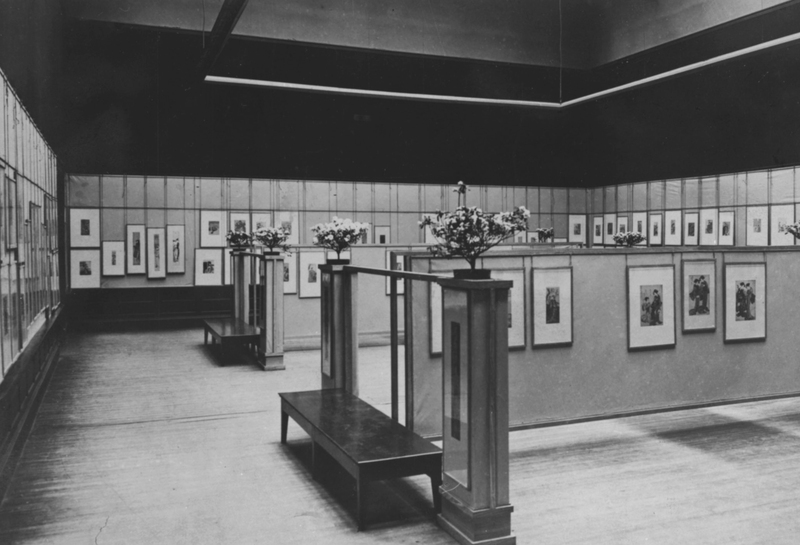 An installation view of the 1908 Art Institute of Chicago exhibition of Japanese color prints, which was designed by Frank Lloyd Wright. 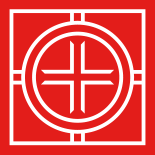 The Art Institute of Chicago Archives.